Accelerated learning (AL) is a multidimensional approach to learning that provides an atmosphere where participants are able to absorb and retain information in a multisensory and natural way. It is based on the latest brain research, and it incorporates techniques that engage many parts of the brain, maximizing the natural way people learn. The approach focuses on involving the whole learner including the emotional, intellectual, and physical aspects. Accelerated learning is based on the principle that knowledge is not something a learner absorbs, but something a learner creates. Therefore, approaches to instruction is more activity-based, rather than presentations-based. These activities are intended to submerse the learner in the learning process. Research has found that people learn best when they have a rich variety of learning options that allows them to use all their senses. Accelerated learning techniques are intended to engage people on many levels simultaneously to use all of the person’s senses. Since the brain is not a sequential processor, but rather a parallel processor, it thrives when it becomes fully engaged doing many things at once. Thus, the natural learning process is not a matter of absorbing one thing at a time in a linear fashion, but rather absorbing many things at once. The purpose of AL is to involve the whole brain to engage the learner in the learning process. This includes both the right and left hemispheres as well as the cortex and limbic systems (upper and lower brain) in learning. Involving the different parts of the brain and their functions makes learning more natural and more effective. The benefits of AL include increased learning effectiveness in less time, with less effort, and with a more enjoyable experience. 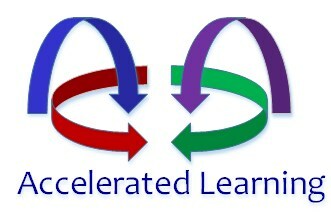 It has been estimated that by implementing accelerated learning techniques classroom time can be reduced by more than 50 percent. Also, because it is multidimensional, it is more impactful and the retention rate is higher.